FORTA Corporation has been a leading developer and producer of synthetic fibers used for a wide variety of applications for over 35 years. 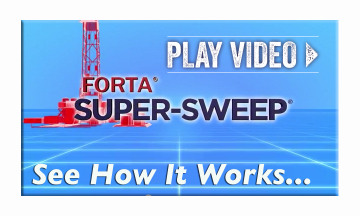 FORTA®’s focus in the drilling industry revolves around specialty drilling fluid and cement additives that address hole cleaning and lost circulation by way of three unique products – FORTA Super-Sweep®, FORTA Super-Sweep Fine®, and FORTA Pheno Seal®. FORTA Super-Sweep® Fiber is a drilling fluid additive, that when added to a drilling mud, increases the suspension and hole cleaning ability of the fluid. Introduced in a pill or slug form, Super-Sweep® is a wellbore cleaning agent that does not increase viscosity. Read more about our hole cleaning drilling additive here. FORTA Super-Sweep Fine® Fiber is a second-generation fiber designed to enable additional capabilities and applications. This shorter, finer fiber is more user-friendly with down-hole tools, and can be added to cement to reduce circulation losses. Click here for additional information on FORTA Super-Sweep Fine®. Pheno Seal® is a chemically stable thermoset laminate used as a drilling fluid and cement additive. It has superior performance in loss circulation, bit balling, and pipe and casing sliding in all water, oil, and synthetic based fluids and cements. Read more about our lost circulation product here.